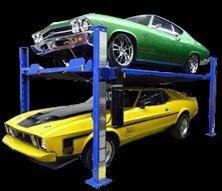 Lift King Automotive Lifts | What Makes Our Lifts Better? Why Choose Lift King Automotive Lifts? We are coming up on our 15 year anniversary of helping Canadians get the best automotive lift product possible for the best price! We have grown to be the largest distributor of lifts in Canada, and we succeeded because of our dedication to customer service and quality. We’re proud to say we built our business on word of mouth from one happy customer to the next. At Lift King, we stand behind our products 100%, and we do everything we can to make each our client’s experience the best it can be! Here are just a few things that set Lift King automotive lifts apart from the rest. We are a family owned and operated business that is Canadian through and through! And while we’ve always shipped from coast to coast, we’re happy to say we also ship worldwide now. At Lift King, we do not just order lifts from the US and try to resell to Canadians at a higher price as most of our competitors do, providing the Canadian market with high quality lifts at an affordable price is our goal. Why is Such-and-Such Competitor Cheaper? Lift King does not offer the cheapest units on the market, nor are we the most expensive, but quality-per-dollar, we honestly feel that Lift King automotive lifts are the best. We offer better built units and accessories than most other companies, and the competitors who I consider to have on par quality are more expensive. When it comes to buying a lift, the old saying is true, “you get what you pay for.” In our opinion, when you have 4000 lbs above you, you’ll be happy you went the extra mile and purchased a Lift King! Are Your Lifts ALI/ETL Certified? Lift King units are CE certified which meets and exceeds all CSA standards. We ship our units around the world, so we need a certification that is accepted worldwide. All of Your Competitors also Say Their Lifts are the Best. What Makes You Different? All lifts look the same in a picture or on the internet, that’s why we always suggest coming to look at lifts in person if you can. While it won’t be visible in a photo, there are some major differences between ours and the other units you will look at. Some differences are quite obvious (steel thickness and design), and some are more subtle (the strengthening beam under the runway or the larger base plate on the post). We know that everyone claims they’re the best, but here at Lift King, we have the best. We are so confident in our product that you can come by our Calgary store and actually see our competitor’s lift in person. We keep them on hand, so we can show you the differences. All we can say is we’d like to thank our competitors for boosting our sales! Your Competitors Offer the Same Lifts as You for Cheaper. Why Shouldn’t I Buy My Lift There? The easy answer is because they can’t be selling the same lifts. If a lift is for sale in Canada, it’s not a Lift King unless it’s made in my facility. We actually own a portion of our manufacturer now to oversee quality control, and there is no other lift in Canada that is from my manufacturing facility. Our competitors imitate our lifts and even create similar logos as a ploy to make customers believe they are receiving the same, high-quality, Lift King automotive lifts, but they aren’t. We have the longest warranty in the business! Lifetime on the structure, and 5 year on the power pack (our competitors range from 1 year to 3 years). Our warranty is also a true warranty. Most of our competitors offer just a limited warranty, and if you actually read the paperwork, they don’t really cover anything. We’ve said before; we’ll say it again: a guarantee is only as good as the company offering it! I am sure there are many questions I haven’t thought to put up here yet, so feel free to call or email to inquire, we are more than happy to help!